This Leyden Cheese Sauce for Burritos is creamy, smooth and crazy delicious! 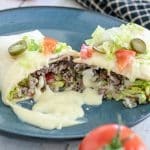 These burritos with cheese sauce can be made with any protein you like! This post is a revision of a post that was published in the early days of Binky’s Culinary Carnival! It was is in dire need of updating! Enjoy! I saw Rachael Ray use Leyden Cheese on her show a few weeks ago. I had never heard of it but when I heard cumin, I was in! Cumin is one of my all time favorite spices! Cumin is a plant, whose seeds are used a lot in Spanish, Mexican, and Middle Eastern dishes! It is native to the Middle East and east to India. It has a unique. smoky fragrance and taste. It is not spicy hot just adds a fantastic flavor! In the eighties, my boyfriend and I used to go to a little Mexican restaurant in Penfield, NY called Fiesta Cantina. Fiesta Cantina isn’t there anymore but I still remember their Burritos with cheese sauce. I married those two thoughts together and came up with Burritos with Leyden Cheese Sauce! It was fantastic!!! The burritos can be made with any protein you like, including; beef, chicken, pork, venison, or even beans if you want them vegetarian! Cheese Sauce is just a white sauce (béchamel) with cheese melted in it. The white sauce is one of the sauces that the French consider one of the “Mother Sauces“. It is believed, however, that the white sauce was actually adapted from Tuscany, in Italy. It is said that the chefs of Catherine de Medici (Queen of France and Mother-in-law of Mary, Queen of Scots) brought it to France. So many people I know are intimidated by white sauces. White sauces get a bad rap. They are so easy! They can be made with any of the new nut milks to make the sauce vegan (if you don’t add the cheese, obviously!). It can also be made milk, cream and any stock. Melt the butter in a medium, heavy bottom saucepan. Heat the milk in a separate saucepan over medium high heat, or in the microwave. This step saves you time stirring. Once the butter is melted and is frothy and bubbly, add an equal amount of flour (or cornstarch or GF flour to make it gluten free). In other words if you use 2 tablespoons of butter, whisk in 2 tablespoons flour. Keep whisking for about 4-5 minutes, until the butter and flour are bubbly. Once the sauce is smooth and thickened, it will coat the back of the spoon, (usually takes about 10 minutes) add cheese one large handful at a time. Melt cheese and stir a few more minutes until bubbly. Taste now and add salt and white pepper to taste. The reason you wait until the end to salt is because different cheeses have different salt content. You don’t want your sauce to become too salty. See how smooth and creamy the sauce is? Prima! Brown ground meat in large skillet. Add onions and garlic to soften. Season with spices. Cut up tomato, lettuce and any other vegetable you like. Build burritos with refried beans, meat and vegetables. Put a few tablespoons cheese sauce inside. Tuck ends in and roll. Arrange on plate with seam side down and then top with the cheese sauce and your favorite toppings. Set up a fixings bar with anything you like. Some great fixings are diced tomatoes, shredded lettuce, sliced hot peppers (either fresh or pickled), sliced green onions, sliced black olives, avocado slices, and your favorite salsa. I hope you like the recipe today for Leyden Cheese Sauce for Burritos! Cumin spiced Leyden Cheese makes these burritos extra special! Flour tortillas , I like 10"
Mix all ingredients together except venison. Add venison to marinade, stir to coat. Refrigerate at least overnight or up to 2 days. Heat cashew milk over medium high heat. Melt butter in a medium saucepan. Don't let the butter brown. Cook flour and butter for 3-4 minutes to remove the floury taste. Whisking constantly, stream in heated cashew milk. Whisk often to avoid sticking to the bottom of the pan. Let sauce cook and thicken, usually about 10 minutes, until sauce coats the back of a spoon. Add cheese, large handfuls at a time, melting the cheese between additions. Cook along for another few minutes until nice and thick. Taste the sauce for salt. Always taste first because different cheeses have different salt content. Add olive oil to a large frying pan over high heat. Add venison pieces a few at a time and brown. flip meat over and brown briefly, some of the smaller pieces may not need to be flipped. Don't overcook. Remove venison to a bowl. Continue to brown the rest of the venison. After all of the venison is browned, reduce heat to medium low. Add the remaining marinade to the pan. Scrape all of the browned bits to the bottom of the pan. Add water, if necessary. Mix cornstarch and water into a slurry and whisk into the sauce in the pan. When thickened to desired consistency, add meat back to pan, briefly. Stir to coat all of the meat in the sauce. Heat tortillas, one at a time in a dry pan over high heat. If you have a gas stove, tortillas can be heated directly over open flame for a few seconds. Spread a few tablespoons frijoles in the center of the tortillas shell. Add as much meat as you like. Roll tortilla and place seam side down on serving plate. Top with cheese sauce and any toppings that you like. My oh my oh my – chipotle and cotija – I love it when cheese and chillies balance each other! Perfect! They do pair so well together! The Leyden is superior with them too! All that cumin and all! Thank you for your comment Tina! Certainly, Edam would work. Gouda would be fine since Leyden is Gouda with cumin. A mild cheddar or Monterey Jack would be great too. Any good melting cheese works well! Thanks for stopping by! Thanks Alyssa! I am glad you enjoyed the recipe! Beth, it looks perfect and tasty! Can’t wait to have this anytime of the day, love it! Thank you Olga! I really love the Leyden in the cheese sauce! Thanks for stopping by!